Please make sure that your system fulfills the requirements listed below before installing Corona | C4D Material Presets. 8GB RAM (16GB and up RAM recommended). Main Library: ≃0.9 GB of available hard-disk space. Texture maps: ≃7.6 GB of available hard-disk space. Cinema 4D® R18 or later. Corona Renderer for Cinema 4D Beta 2 or later. This guide is to serve as a reference for installation of Corona | C4D Material Presets Library for Cinema 4D. You can download the latest official version of Corona | C4D Material Presets Library and Textures from www.sigerstudio.eu with the account supplied to you by Siger Studio. Download and unpack archive sigershaders-corona_xx.rar. Now you can find library in Cinema 4D Content Browser. Download multipart RAR archive with textures from Downloads page. You need to download all parts of archive to be able to begin the unpacking process. For unpacking of archive you can use WinRAR or other compatible software. If you have downloaded all files needed, e.g., all eight “.part1-8.rar” RAR files, and placed them in the same directory, it is sufficient to double-click the file with the extension “.part1.rar” to start the unrar process (First part only! All other parts will be found and extracted automatically!). Create a folder anywhere on the local or network drive, then extract downloaded archive to this folder (will be created an additional folder "tex"). Start Cinema 4D. 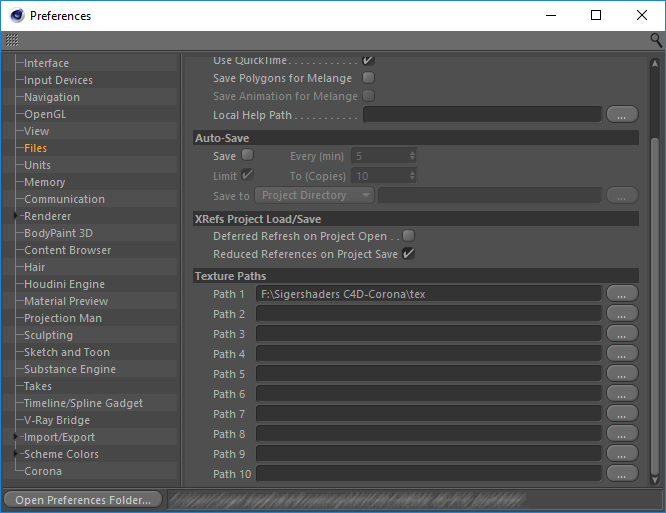 Open Preferences dialog and specify path to the textures folder (include "tex" directory).